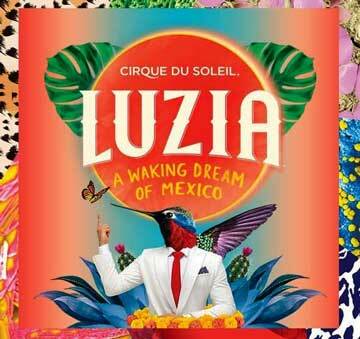 An exquisitely designed and performed production, this time on a Mexican theme, with astounding juggling, acrobatics, clowning, contortionism, and much more. Cirque du Soleil, the Montreal circus powerhouse, more or less invented the concept of the artfully conceived circus show based on a particular theme, visually stunning and beautifully choreographed. It has spread its riches far and wide, with many traveling shows and some established firmly on an ongoing basis in Las Vegas and elsewhere. Each production features its own array of circus acts, which are magically enfolded into the thematic nature of the production. In this way, each distinctive set of performers brings out their own unique tricks, but it all manages to feel of a piece in the context of the production. Though I have always enjoyed Cirque du Soleil productions, this one, I must say, has a kind of beauty and exquisiteness that is worth special note. From start to finish the show is intoxicating in so many different ways that it provides an overwhelmingly satisfying experience. 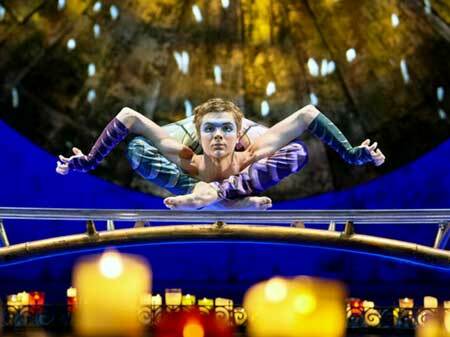 Stories do not tend to create the narrative fabric of Cirque du Soleil shows, but there are dominant themes that evoke all kinds of compelling images. In this one, desert life, exemplified by dancing cacti, and flowers which bloom when the rains come, provides a significant early theme. 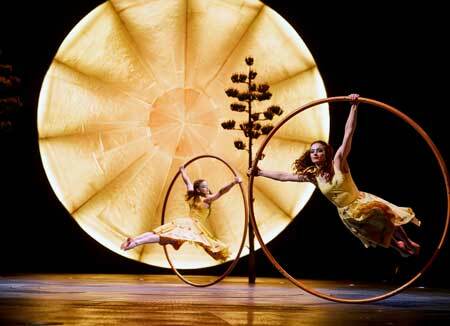 Swirling unbelievably on large rings, two yellow-adorned women acrobats, Rachel Salzman and Angelica Bongiovanni, along with a woman ascending on a high trapeze, bring the flowering of the desert to life. Part of this show involves actual water, dropped in sheets from the top of the circus tent, sometimes merely to anoint the acrobats, as is the case with the yellow spinning flower ones, but, at other times, to exhibit more involved shenanigans. Fool Koller, the clown, is hilarious, engaging the audience at some length during intervals between acrobatics. His funniest scene involves chasing falling spouts of water that seem to elude him at every turn. Running back and forth between spouts, the clown drew exuberant laughter, most notably from what seemed like every small child in the audience. At one point, the water is not merely dropped in sheets but with computer generated pictographics embedded in the sheets, varied, ever changing, stunningly done. Apart from the amazing costumes and constantly changing projections on the large disk-like screen above the circus stage evoking the sense of an Aztec calendar in the abstract, the circus acts are all very good, some of them striking and distinctive. Rudolf Janecek, the lighting-fast juggler, works principally with cylindrical pins that he begins juggling at warp speed and then goes up from there, adding torque and pin numbers with each passing moment. Pins drop down from the top of the tent and join the already growing population in his hands, ever developing with fascination and drama. Aleksei Goloborodko, the cortortionist, is literally not to be believed. I remember seeing a cortortionist named Zamoratte in the first Big Apple Circus production I went to many years ago and was amazed when he folded himself into something the size of a suitcase. Goloborodko is equally amazing, and in some ways, more astoundingly flexible than even Zamoratte or any other contortionist I’ve ever seen. One gasps watching it. Acrobats flying through mounting series of hoops, head-first, legs first, over and above one another in multiple layers, are fast and fabulous. A strong man balances on ferociously sturdy arms with incredible grace and with increasing height as he adds lengths of a dowel-like structure (with hand grasps) to one another and literally sways in the heights as he presses himself aloft sometimes barely on one hand. A woman in a pink dress almost dances as she is thrown among three or four strong men, gyrating balletically as she does so. Bouncing platforms create the opportunity for an entire troupe to fly from one and land on another, sometimes in parallel and unison. A solo acrobat, pulled aloft with speed and ardor, crawls and twists up and down a rope-like structure, landing in a pool, one moment high above, earthbound the next, exceedingly daring and graceful. Two fleet-footed dancer-acrobats, Laura Biondo and Abou Traore, do amazing things with soccer balls, capturing them on their feet, twisting them around their bodies, doing everything one would not expect with balls, managing them with unbelievable finesse. And multiple single-pole climbers make the rapid ascents and descents, sometimes with horizontal feats of full body extension, seem facile. Music – live – with lots of the feel of a Mariachi band – is plentiful and wonderfully engaging. What a show! The art, the grace, the visual splendor and the magnificent circus-ry makes this a splendid outing. Catch it before it leaves.